With the buzz about content marketing lately, the importance of content - especially written content - is becoming increasingly clear. A recent Hubspot survey has revealed that marketers with blogs generate 67% more leads and that the more content you publish, the more traffic and leads you will get. While this is valuable data, it’s important to realize that there’s a right and wrong way to marketing with content. Have a fixed schedule. This is especially important if you’re a business; while it’s okay to want to write whenever you have something to say, you won’t get any real results until you have a consistent schedule. If you want to blog twice a week, blog twice a week; don’t suddenly publish a post a day for 2 weeks and then abandon your blog for the next 2 weeks. The above are 5 different forms of content you can write and they’re much more powerful than the "me too" blog posts; in my own experience, every single resource post I’ve written has outperformed how to and "tips" article by at least 300%; traffic to these articles keep increasing every month and so does the leads that come with them. Popular blogger, Neil Patel, also documents how publishing a massive resource post resulted in significantly more traffic to his blog than other articles he’s written; this type of post will take more time since it’ll usually be a combination of several posts, but it’s much more powerful and practical. Also, my experience with writing posts that are "ultimate guides" has revealed that not only do these kinds of blog posts get more shares and traffic, but they result in more leads; these kinds of posts are usually several thousands of words long and contain visuals. You can also experiment with interviewing experts that use the same strategy your company advocates or that use the tools/products you offer, or you can interview real people getting results with your products; this validates your strategy and encourages more people to check out your offering. Depending on who is interviewed, this kind of post might not get a lot of views but it has great potential for generating leads. Success stories work in a similar way. They validate what you do and advocate and as a result make people more likely to check out your offering. Guest blog. You’ve probably heard about it several times before, and it works. In most cases, especially when you’re just getting started with your blog, you don’t have the audience that can give your content a push and that’ll help you achieve real impact. By guest blogging for relevant authoritative blogs, you get access to this audience and build yours over time. Repackage your content. Once you’ve written your content; blog posts, eBooks etc. you can get more exposure by repackaging them into eBooks and slides and then distributing them to sites like a href="https://www.slideshare.net/">Slideshare and Scribd. These sites have the audience you can tap into by submitting your content exposure and they also support a format that allows you to brand yourself. I’ve published a slide on Slideshare that got 15,000+ views – around half of that alone came from Slideshare itself – that I wouldn’t have gotten if I didn’t tap into the existing audience Slideshare had. 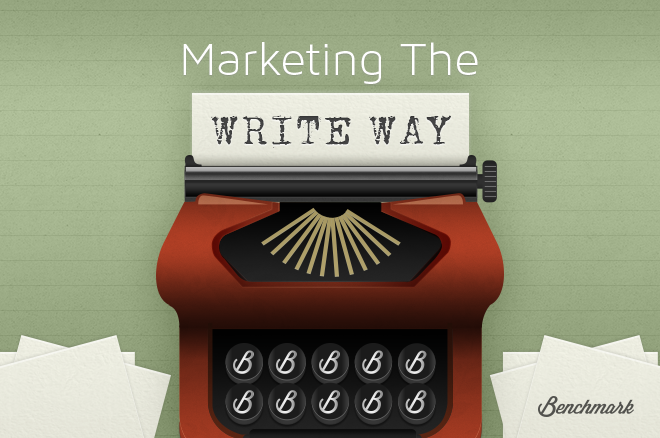 Ultimately, effective writing-based marketing is based on two things; writing your content and distributing it. On the one hand, you have your own blog with regular updates from you and on the other hand you regularly contribute articles to other sources that can give you branding, links and exposure; this benefits you on the long run. Great post! This is true, while writing a blog post you should always think of ways on how to distribute once you have finished them. One important thing to add is integrating yourself into a community of bloggers that are like minded. Good post all in all. Thanks!